(CNN) -- The BBC said Sunday it is "deeply concerned" about an unknown militant group's claim that it has killed a BBC reporter kidnapped last month in Gaza, but is treating the statement as a "rumor with no independent verification." In a statement faxed to news agencies Sunday, the Tawad and Jihad Brigades promised to "distribute a video showing his killing to media channels soon." Palestinian Interior Minister Hani Qawasame said Sunday that as far as he is aware, Johnston is alive, and Palestinian chief negotiator Saeb Erakat said that the kidnappers have made no demands. The BBC has informed Johnston's family of the statement and is working with Palestinian officials to investigate the claim. Johnston, 44, is the only Western journalist permanently based in Gaza. The BBC organized a rally in the West Bank city of Ramallah on Thursday, one month after Johnston went missing. Speaking at the rally, Mark Thompson, the BBC's director-general, issued an appeal "to all those who may have influence with the kidnappers to use their best endeavors to secure Alan's release, safely and speedily, and to ensure his return to his family and friends as quickly as possible." Thompson told reporters he had met Wednesday with Palestinian Authority President Mahmoud Abbas and Abbas told him that there is "credible evidence" Johnston is "safe and well," and that Palestinians authorities are "fully engaged with Alan's case and are working to resolve it as soon as possible." Thompson said the BBC has had no direct contact with Johnston's captors and had not received any ransom demands. Since 2004, 15 journalists -- including Johnston -- have been abducted by gunmen in Gaza, according to the Committee to Protect Journalists. All were released unharmed, most within days of their kidnappings. 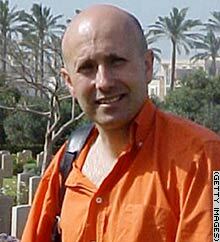 Johnston has been held longer than any other journalist abducted in Gaza. The longest previous time in captivity was for Fox News' Steve Centanni and Olaf Wiig, who were held for two weeks in August. Most of the kidnappings appear to be the work of "private individuals or groups seeking to exploit foreign hostages for political purposes or to use them as bargaining chips to secure the release of jailed relatives or to win government jobs," according to the Committee to Protect Journalists. Reporter Alan Johnston, shown in Gaza in an undated photo from the BBC, was apparently abducted March 12.